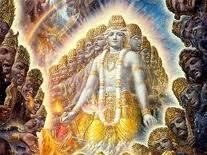 The epic Mahabharata contains so much of teaching that it is considered to be the fifth veda. Following are some interesting unpopular stories involving mahabharata characters Draupadi, Drona, Karna, Jarasandha, Arjuna and of course, Shri Krishna. Why was Drona invincible in Mahabharata war? Drona used a weapon called brahmadanda on fifteenth day of Mahabharata war for the first time in his life. Brahmadanda was Brahmarishi Vashistha’s best weapon and it contained the spiritual powers of the 7 greatest sages (Sapta Rishis). As Drona had not imparted knowledge of this secret weapon to either Arjuna or Ashwaththama, therefore no Pandava, Yadava or Panchala could handle Drona on the 15th day of battle. Therefore the Pandavas were forced to do cheating to kill Drona. Arjuna used the weapon anjalika to behead Karna. The chariot wheel remained stuck and the curse of Parashurama ensured that Karna could not recall the mantras necessary to unleash the more powerful weapons of mass destruction. Krishna reminds Arjuna of Karna’s ruthlessness against Abhimanyu when Abhimanyu was similarly left without a chariot or weapons. All of Arjuna’s tears, pain and anger swelled up within him as he aimed the fatal shaft Anjalika at a desperate Karna and beheaded him. Draupadi, one of the panchkanya’s, alongwith Kunti could remember her past lives. In an earlier birth, she made Shiva happy and asked him to grant him a boon so that her husband has fourteen qualities. He said that it is not possible to have all qualities in one fellow. She insisted and her wish was fulfilled in form of Pandavas. Brahma givena a boon to Hanuman: “Nobody will be able to kill you with any weapon in war.” This happened when Lord Vayu decided to let people suffer in absence of air after Indra hit him with Vajra astra while Hanuman was approaching to eat sun. He was killed by Dashavataras of Lord Vishnu in past lives and thus fuelling hatred for Lord. During Rajya sooya yagya, he insulted Shri Krishna. He kept silent because he has promised that he will forgive Shishupala’s hundred sins. 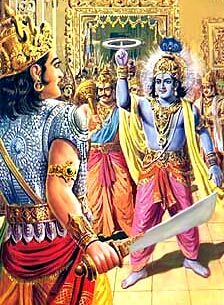 However, as soon as the count of hundred completed, Lord killed him with the Sudarshan chakra, his favourite weapon. It is said that Bheema, Duryodhana, Keechaka, Jarasandha and Hidimbasura were born in the same cosmic phase. The five great warriors Bakasura, Bheema, Keechaka, Jarasandha and Duryodhana are all born with their fate mingled with each other. As a result of that, the first amongst the five to kill the another,will eventually kill the other three. This secret was known to Krishna alone. This is why he ensured that Bheema kills bakasura on first available opportunity. Bheema ended up killing every other warrior in Mahabharata war. 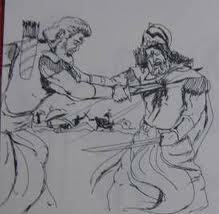 Kichak was making undue advances towards Draupadi and killed by Bheem in the kingdom of Virat. Thanks a lot… I am a gr8 gr8 fan of mahabharat……and these facts really made me thrilled…. sanjay did not actually " see" the vishwaroop but only a dazzling light..